This page is for the SOUND VOLTEX II -infinite infection- song titled Smile. 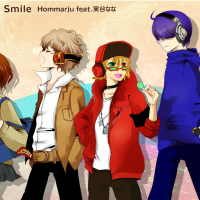 For the beatmania IIDX 14 GOLD song of the same title, please see smile. For the pop'n music character of the same name, please see Smile (character). 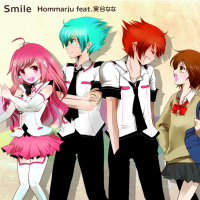 Smile is a song part of the SOUND VOLTEX II -infinite infection- Production Confirmation Commemorative Original Song Contest (SOUND VOLTEX II -infinite infection- 制作決定記念 オリジナル楽曲コンテスト). It was added to SOUND VOLTEX II -infinite infection- on August 23rd, 2013. 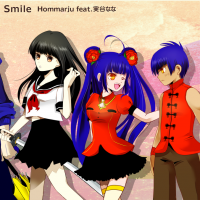 The jacket for Smile is divided into three parts, one for each difficulty mode. SOUND VOLTEX characters RASIS, Tsumabuki Left, Tsumabuki Right, and Kouki appear in the BASIC/NOVICE jacket. Hiiro Furitsu, SOUL SEKISHI, and RAIN AOSAME appear in the MEDIUM/ADVANCED jacket. Kureha, TSUBAKI, and FUKURYU appear in HARD/EXHAUST jacket. In REFLEC BEAT, Smile uses its SOUND VOLTEX NOVICE, ADVANCED, and EXHAUST jackets for its BASIC, MEDIUM, and HARD difficulties, respectively. Smile is one of the songs in Part 6 of FLOOR INFECTION. During its periods of availability, it can be unlocked in the REFLEC BEAT series by playing 2 rounds of the corresponding SOUND VOLTEX series game to raise the infection level to Level 1 MAX. For more information on the dates it can be unlocked, please see the event page. REFLEC BEAT to groovin'!! Upper difficulty rated from 1 to 10+, and from 1 to 13 in VOLZZA/VOLZZA 2. This page was last edited on 13 November 2018, at 02:22.